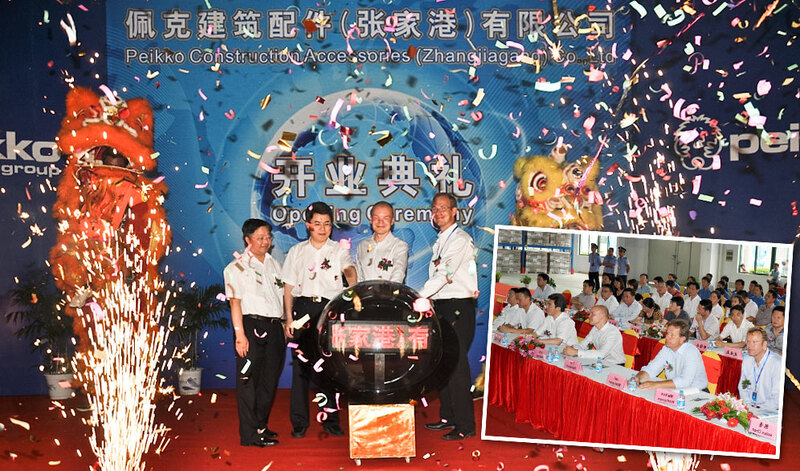 The official opening ceremonies of Peikko´s unit in China, Peikko Construction Accessories (Zhangjiagang) Co. Ltd., were held on 3 August 2011. Peikko was honored to have several distinguished guests, Mr. Liang Yibo, Secretary of Zhangjiagang EDZ CPC Working Committee, Deputy-Secretary of Zhangjiagang CPC Committee, Mr.Tao Huixing, Committee Member of Zhangjiagang EDZ Administration Commission, Member of Zhangjiagang EDZ CPC Working Committee, Mr. Pang Jianyang, Director of Zhangjiagang EDZ Investment Promotion Bureau, Mr. Zhou Aijun, Deputy Director of Zhangjiagang EDZ Investment Promotion Bureau, and Mr. Antti Haapea, Deputy Consul General, Consulate General of Finland in Shanghai, to perform the official opening of the factory. In addition, more than 70 other guests presenting the local government, tax officials, police, customs, suppliers, service providers and customers, attended the opening ceremonies. During the opening week the first shipment of ready-made products left Peikko China’s premises. The first shipment was made to a Peikko unit in Europe. The production and quality control team is in full speed to increase the output of the existing product range and also to add some new products. There are currently some 30 persons employed by Peikko China. "We are happy to have such a pleasant start at Peikko China. After successful and timely production start the next key challenge is to start local sales activities in the country which has become the biggest construction market in the world”, states Topi Paananen, CEO of Peikko Group Corporation.